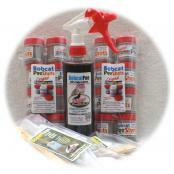 100% Pure Bobcat Urine is the all-natural rodent repellent for mice and other small rodents like moles and voles. At certain times during the year mice are looking for a nesting place, warm shelter or an easy food source. Your home or other buildings are often their destination. If you want to keep mice out of your house, attic, basement, garage, shed etc., the Bobcat Pee Bobcat Urine is what you need. You can protect you home from mice by using 12 oz or 16 oz liquid or YardCover Shakin' Flake Granules for outside use and to create a "pee-rimeter" around your home. If you need to get rid of mice already inside, BobcatPeeShots are perfect to drive mice out of garages, sheds, attics, cars, RV's, boats and basements. Browse our natural mice deterrents below. 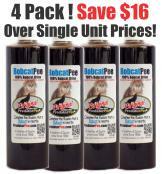 BUDGET SAVER 4 PK Bobcat Urine - Save $16! Budget friendly way to stock up for the season - Save $16 over single bottle prices when you buy this 4-pack of Bobcat Urine 12 ounce bottles. Free Priority Mail Shipping, too! 16 ounce trigger spray bottle of 100% Pure PredatorPee® Bobcat Urine combined with a 10 pack of our Scent Tags at a great price. Place the Scent Tags every 10-12 ft using the included twist ties and ground stakes. Saturate with “pee” to create a long-lasting “pee-rimeter” - Big Savings when you buy multiples! ALL NEW! 100% Pure PredatorPee® Bobcat Urine - 64 oz Jug. Use to refill our 12 oz squirt bottle, 16 oz spray bottle, or simply attach the included adjustable sprayer and squirt right out of the jug! Save $20 over single bottle prices! 12 ounce bottle of 100% Pure PredatorPee® Bobcat Urine combined with a 10 pack of our Scent Tags at a great price. Place the Scent Tags every 10-12 ft using the included twist ties and ground stakes. Saturate with “pee” to create a long-lasting “pee-rimeter” - Big Savings when you buy multiples! 16 ounce trigger spay bottle of 100% Pure PredatorPee® Bobcat Urine combined with a 10 pack of our weather proof 33 Day Dispensers at a great price! Hang the dispensers every 10-12 ft using the included twist ties and ground stakes. Fill with about an ounce of “pee” to create a long-lasting “pee-rimeter” that is protected from wind and rain - Big Savings when you buy multiples! ALL NEW! 100% Pure PredatorPee® Bobcat Urine - 64 oz Refill Jug together with a 16 oz spray bottle and 6 packages of Scent Tags to set up a "pee-rimeter." This combo will treat approximately 600 linear feet! Save big over single unit prices! PredatorPee® 100% Pure Bobcat Urine - 12 ounce squeeze bottle - Big Savings when you buy multiples! 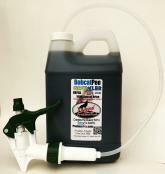 100% Pure PredatorPee® Bobcat Urine - 16 ounces in an adjustable trigger spray bottle - Big Savings when you buy multiples! Original PredatorPee® Bobcat Urine Yard Cover Shakin' Flake Granules – 16 oz jar. Each Jar covers about 200 sq ft – Perfect for burrowing and digging pests. Great for lawns, flower beds, gardens, container gardens, etc. - Big Savings when you buy multiples! 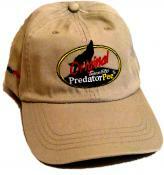 An 8 pack of vent-top canisters that are “pee-loaded” with PredatorPee® Bobcat Urine. Designed for indoor use in attics, basements, sheds, garages, under decks, barns etc. Also perfect to stop wire & upholstery chewing in boats, rv's, cars, trucks, atv's, snowmobiles, motorcycles etc. Just remove the lids and place for a month or more of protection - Big Savings when you buy multiples! Includes five 64 oz Growlers of Predator Pee Bobcat Urine equal to twenty 16 oz bottles worth, a reusable 1 gallon heavy duty sprayer, and fourteen packages of scent tags. Protects four acres or 1600 feet! Save $270 over single item prices! Bobcat Urine Outdoor-Indoor Combo Pack - Save $16! 8-Pack of Bobcat Urine PeeShots - to drive animal pests out of attics, basements, garages and sheds! BobcatPee RV Pack for Mice contains: (2) 8-packs of BobcatPeeShots, (1) 16 oz BobcatPee Trigger Spray Bottle and (2) 10-packs of ScentTags, Ties and Stakes – Only $99 - Save $12 over single unit prices! Save big over single bottle prices. Everything you need to create a perimeter around a ¼ acre yard (100'x100') Contains 4 – 12 oz Bottles of PredatorPee® plus enough ScentTags to hang every 10'-12' around the entire perimeter (four packages). That's enough for at least 2 months of protection! Choose Mountain Lion urine, Wolf urine, or Bobcat urine here or at checkout. 12 ounce bottle of 100% Pure PredatorPee® Bobcat Urine combined with a 10 pack of our weather proof 33 Day Dispensers at a great price! Hang the dispensers every 10-12 ft using the included twist ties and ground stakes. Fill with about an ounce of “pee” to create a long-lasting “pee-rimeter” that is protected from wind and rain - Big Savings when you buy multiples! "I've been using your products for mice and rats and am really happy with it. I tell everybody about it. In fact, I just rave about your product. Thank you so much!" "I have been using your products for 12 years now. I ran out. Bobcat pee totally takes care of the mice. My friends think Im nuts. I had an exterminator tell me about predator pee."